Check out the third annual garment issue of Handwoven. It is brimming with great weaving tips and techniques for handwoven clothing and accessories. From insightful articles to fun projects, this issue will have you creating beautiful garments out of your handwoven fabric with ease and pleasure. Learn how Susan Neal designs fabric with garment design in mind and creates graceful, wearable, and mindful pieces. Robyn Spady gives yet another example of creating weaving drafts from fabric, this time using a vintage speaker cover (grill cloth) as her inspiration. Marlene Lloyd and Helen McKee show off the versatility of handwoven vests with unusual approaches to garment construction. Discover folk costume in Eighteenth-century Normandy and create a bag inspired by the traditions. Join Sara Bixler in the Yarn Lab as she discusses using vibrant Noro yarns with color-spun repeats in your weaving with truly stunning results. Test weaving skills with 14 weaving projects for handwoven clothing and accessories! Nancy Arthur Hoskins and Marilyn Roberts elegant warp-painted silk. Lavendar’s Blue: A Shawl Fit for a Queen (featured on the cover) and Allen Walck’s white and gold twill Bal à Versailles vest are luxurious enough for royalty. Maxine Fontana’s three-tier Sun-Flirty Sundress is fun and fresh as spring while Rebecca Fox’s Shaken, Not Stirred dapper men’s waistcoat is perfect for formal events and more casual evenings out alike. Other projects include an Art-Deco Infinity Wrap by Laura Wilson-Gentry, a sparkling rigid-heddle scarf with matching kumihimo necklace by Linda Gettman, a colorful pin-loom woven tote bag by Marcella Edmund, and a pinwheel Twinkling Stars Skirt by Sandra Staff-Koetter. 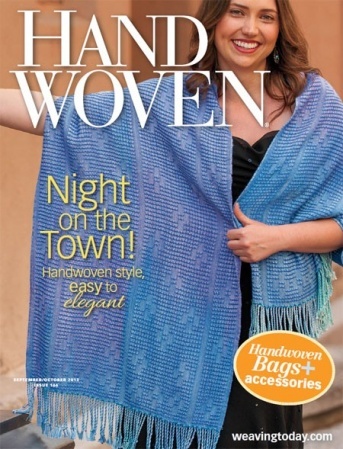 If you’re looking for an outfit or accessory for your ideal night on the town, the September/October 2013 issue of Handwoven magazine has what you're looking for.